The new Cantina Bell menu shows the influence of Chipotle on the industry and the real future of American food. 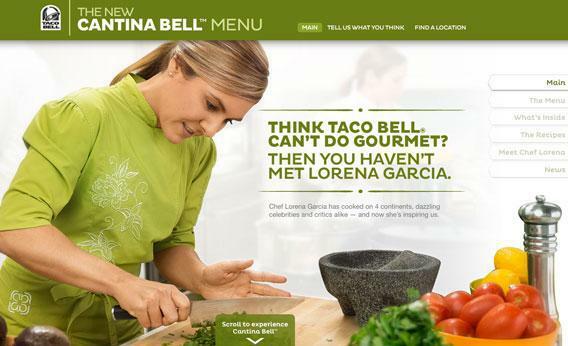 Chef Lorena Garcia is the face of Taco Bell’s new Cantina Bell menu. When I wrote in February that Chipotle deserves to be taken seriously as an innovator just like Apple, the reaction of the Bay Area burrito snobs was fast and vicious. But in the circles that count, it’s clear that Chipotle is regarded as a major innovator, attracting what all major innovators attract: copycatting. So it’s no coincidence that after a couple of years of crazy growth from Chipotle, Taco Bell feels it has to step up its game. Thus, this summer the country’s leading quasi-Mexican fast-food chain has rolled out its new Cantina Bell line of upscale menu items. Of course, allegations of copycatting can grow contentious, as in Apple’s ongoing mega-litigation against Samsung. From a consumer viewpoint, this effort to squelch competition is preposterous. But common sense says it’s no coincidence that all modern smartphones are little slabs with large multitouch screens and full-screen apps. Once a compelling idea meets success in the marketplace, other people rush in to serve the newly identified market not with identical products but with similar ones. It’s a worthwhile process because firms gain efficiency by specializing and narrowcasting. And because consumer preference vary, we’re better off having a bunch of different companies offering different variations on the same basic theme. Thus, while Chipotle will give you a chicken burrito with black beans and cilantro-lime rice, the Cantina Bell burrito offers citrus-marinated chicken, cilantro rice, and black beans. Different—but not too different. But beyond the food, the telling element here is the marketing. Taco Bell is traditionally known for making waves with things like its FourthMeal campaign and its Doritos Locos Tacos, offerings that positively revel in fast food’s bad reputation. Taco Bell, these items scream, is the restaurant for you if you happen to be very drunk or extremely high. 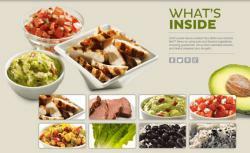 Cantina Bell is branded separately, with its own website and classy photography. The face of the marketing campaign isn’t brash young dudes scarfing burritos—it’s a chef, Lorena Garcia, handcrafting the food. She’s even Latin American (albeit Venezuelan rather than Mexican, but in any case burritos appear to be an authentic product of California), vaguely suggesting an enhanced level of culinary authenticity. In line with the upscale presentation, Cantina Bell’s food is pricier than most Taco Bell offerings, albeit still cheaper than Chipotle. And people seem to like it. Nobody’s claiming this is the greatest meal on the planet, but it’s widely hailed as a great value. This is more than the story of one company’s repositioning in response to an upstart’s success. It’s a microcosm of the ongoing transformation of the fast-food sector and its efforts to transcend its own lowly origins. In recent years, there’s been a strangely reactionary response to the very real problems with fast food. Authors such as Michael Pollan and Mark Bittman regularly exhort us to abandon the false idols of fast food and the heresy of chef-themed television programs in favor of the old-time goodness of home cooking. To an economist, this sounds like a strange idea. Across the board, the march of progress is toward greater specialization and a finer-grained division of labor. The oft-cited point that cooking at home is thriftier is accurate, but it illustrates exactly how unlikely a mass revival of home cooking would be. Building your own computer from scratch is cheaper than ordering one from a store. But doing so is time-consuming and skill-intensive. Some people do it because they enjoy the work—just like I enjoy cooking—but for most people in a prosperous society, it makes sense to pay someone else to do it. Research from Dora Gicheva, Justine Hastings, and Sofia Villas-Boas shows that when gasoline prices rise, households respond by eating out less and buying more groceries, indicating that people aren’t confused about the costs. They just prefer to do less cooking when they can afford to do so. And as Americans get richer, they will cook even less. This isn’t to say the other criticisms of fast food—low quality, poor nutrition—are invalid. Rather, they’ll be addressed in exactly the way the burrito market is improving. New companies will find ways to standardize a better product than what’s currently on the market. If they succeed, others will follow. And evidence of the up-scaling of the fast-food marketplace is everywhere these days. The food industry research firm Technomic recently created a new and booming “better burger” chain category to distinguish upscale burger offerings from the McDonald’s/Burger King/Wendy’s level of operation. In Washington and New York, people are lunching on salads composed of fresh and often local ingredients at Chop’t, while the similar Mixt Greens expands in Los Angeles and San Francisco. Perhaps most ambitiously, Lyfe Kitchen in Palo Alto, Calif., is attempting to serve an upscale, healthy fast-food menu built on a foundation of no butter; no cream; no white flour or sugar; no high-fructose corn syrup; no trans fats; and all grass-fed, humanely raised animals. The proprietor, Mike Roberts, is a former CEO of McDonald’s, and his aspiration is to take this concept to scale—not just one restaurant or a dozen, but a vast national chain. That is a far higher aspiration than Cantina Bell’s somewhat better burrito. But progress is being made all up and down the ladder. The entry of new higher-end places is precisely what’s driving the Taco Bells of the world to raise their games. In the end, it means that nasty fast food as we know it is almost certainly doomed. It won’t be brought down by a backlash against chains but by the same process of innovation, competition, and scaling that we see in other sectors of the economy. And given how fundamental eating is to both health and human sociability, the steady progress in the restaurant industry is a bigger deal than it’s given credit for.